We’ve experienced that history sometimes has a way of repeating itself. Thirteen years ago in 2005, Darci Stone’s husband, Eric James Stone stood on stage as a Quarterly Award Winner of the Writer’s Contest. And now his wife, Darci, who started dabbling in writing speculative fiction while dating and attending Eric’s weekly writing group sessions, has walked off with the Grand Prize as Writer of the Year. For illustrator Kyna Tek, who was born in a refugee camp in Thailand and whose family later immigrated to America, winning the Illustrators of the Future Grand Prize is a dream come true. In keeping with the evening’s “Magic and Wizardry” theme, the gala celebration opened with magician/mentalist Spidey and magician/illusionist Joel Meyers performing a visually stunning dueling wizards routine with floating objects appearing in mid-air. Later in the evening, they performed a very interactive routine with the participation of celebrities and audience members. Coordinating Writer Judge David Farland and fellow Writer Judge Brandon Sanderson announced writer Darci Stone as the Golden Pen Award winner while presenting her a check for $5,000. Darci’s story entitled “Mara’s Shadow,” was illustrated by artist Quintin Gleam. Over the years, submissions for the Writer and Illustrator Contests have come in from over 175 countries. And this year we received entries from three new countries: Andorra, Seychelles and Benin. Selecting the two Grand Prize Winners from the thousands of contest entries submitted every year was not an easy process. The awards show was held in the Elks Hall of The MacArthur, a historic Los Angeles landmark conceived in a visually opulent Gothic Revival architectural style with cathedral-like ceilings. The book signing and reception, which followed the awards event, was held in the equally well-appointed Grand Ballroom. 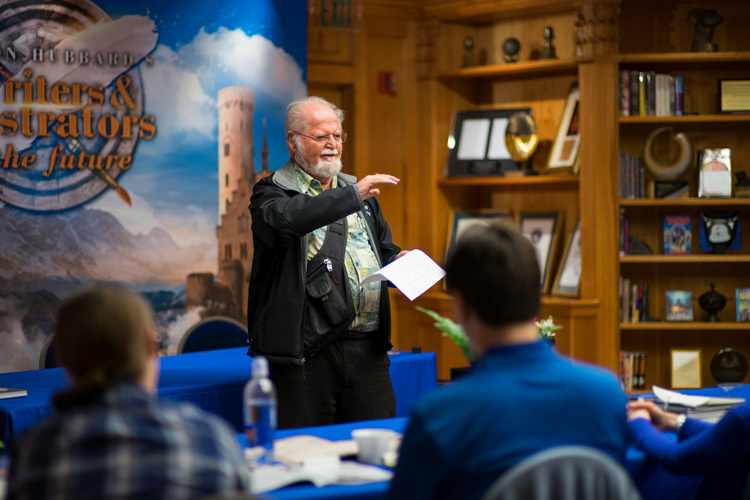 Artist and Illustrators of the Future Judge Larry Elmore was presented with the L. Ron Hubbard Lifetime Achievement Award for Outstanding Contributions to the Arts. Larry has been an inspiration for countless artists over the years including this year’s winners Kyna Tek and Anthony Moravian who thanked him from the stage. It was Larry who told Kyna to enter the Contest after seeing Kyna’s artwork at a convention—and the rest is history. Actress Judy Norton sang “My Father’s Song” written by composer/lyricist Pauline Frechette as part of an In Memoriam tribute to two of our esteemed Contest Judges who passed away over the last year, Jerry Pournelle and Yoji Kondo. Galaxy Press’ President John Goodwin unveiled the print and audiobook editions of L. Ron Hubbard Presents Writers of the Future Volume 34. The book was edited by David Farland and features artwork by artist Ciruelo on the cover. It includes stories and essays by well-known authors and artists Orson Scott Card, Brandon Sanderson, Jody Lynn Nye, Jerry Pournelle, Ciruelo and Echo Chernik. For a complete listing of the contents of the book and the names of all the winners, go here. Awards for each of the Quarterly Finalists of the Writers and Illustrators Contests were presented by actors Nancy Cartwright, Jade Pettyjohn, Sean Cameron Michael, Catherine Bell and Lee Purcell, along with judges from the Contests. 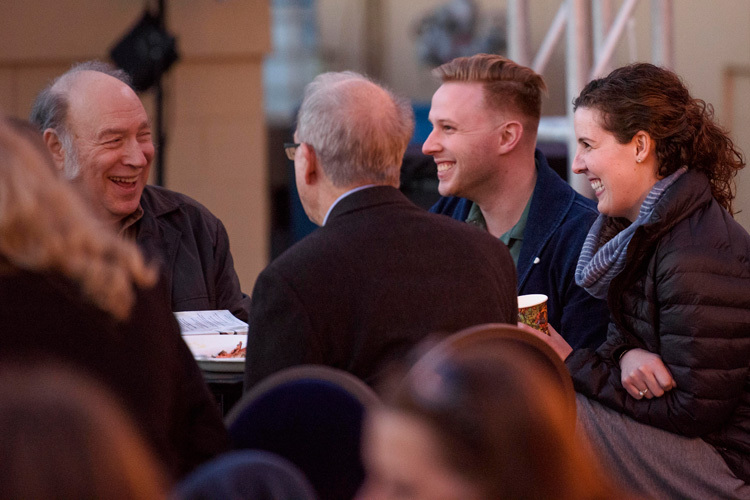 Photos from the event are posted below. All in all, a very magical evening for all this year’s Writer and Illustrators of the Future winners.